Dorayaki is an easy treat for kids (and adults!) that doesn’t take much time and can be frozen for later use. I adapted my recipe from the Shizuoka Gourmet blog. (I tried several other recipes and this seemed the most authentic to me). 1. In the order listed, mix one ingredient at a time in a large bowl until everything is mixed together except for the sweet anko paste. 2. Heat a non-stick pan to medium heat. Wipe a very thin layer of oil on the pan with a paper towel. 3. Pour the batter onto the hot pan (about 1/4 cup at a time). Try to make each circle the same size. 4. (just like you’re making pancakes), flip over when the top begins to bubble. It should have a golden brown color when flipped. 5. Cook a few more minutes then transfer onto a plate. 6. When cooled slightly, spread a generous layer of anko between 2 pancakes. If you’d like, wrap each individual dorayaki in saran wrap to help it hold its shape. 7. Eat right away or freeze (wrapped in saran wrap). I have heard that you can mix grated carrots into the batter to make dorayaki more healthy. Great idea! To make it more unhealthy, you can also add whipped cream to the anko filling. YUMMERS! 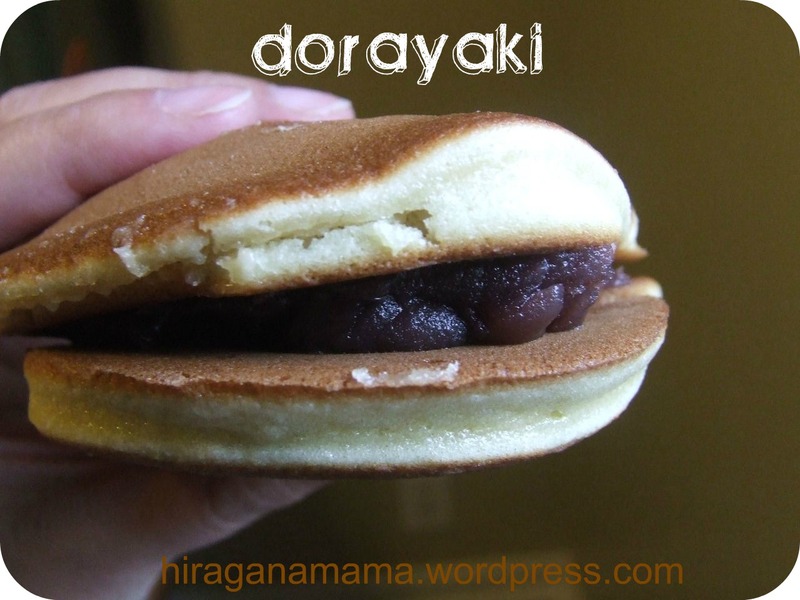 My friend Nami just blogged about Dorayaki too! I haven’t tried her recipe yet but I am sure it is awesome, because everything I’ve made from her site has been delicious. I can’t mention dorayaki without mentioning Doraemon. He is a famous cartoon character who LOVES to eat dorayaki! Click HERE to read my blog post about him! Hi Hatsuho! Thank you for the mention!! 🙂 Dorayaki is a very quick and easy snack, and I’m glad my kids are enjoying the same snack that I love… so that I can make and eat often. Your dorayaki look delicious~~~! I love making dorayaki~ Wonderful recipe. Thanks! I’ll try this recipe next time I make it. Can’t wait to try this out! Check my blog?